The Fort Bend Museum Association sponsors Texian Market Days at the George Ranch Historical Park. This event offers a living view of the past in Texas with costumed staff and volunteers presenting vignettes of daily lives and heroic moments from the early days in the Stephen F. Austin Colony (1830s) through the late years of the Great Depression and World War II (1940s). The event benefits the educational programs of the Fort Bend Museum Association, including the George Ranch Historical Park. 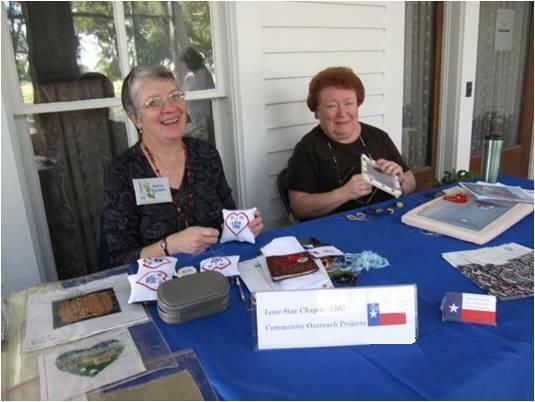 Lone Star has participated by stitching on the porch of the main house, the George House, and exhibiting different forms of needlework. Andrea Standefer (L) and Linda Edney (R) stitch on the porch of the main house.